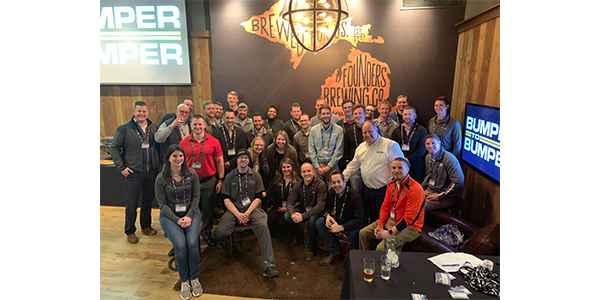 The Auto-Wares Group of Companies hosted the most recent YANG regional meet-up on Feb. 7 at Founder’s Brewery in Grand Rapids, Michigan. Despite winter flurries and difficult road conditions, more than 50 Young Auto Care Group members turned out for a night of networking and fun. Welcomed into their own private room inside Founder’s Brewery, guests enjoyed delicious food, an array of craft beers and a raffle for prizes and swag. The event’s highlights included exclusive brewery tours and a short speech by Auto-Wares President & CEO Todd Leimenstoll. The group included people from across the aftermarket distribution chain, including manufacturers and suppliers, warehouse distributors, jobbers and shop owners along with technicians and service writers. The event served as the perfect precursor for Auto-Wares’ annual Auto Value and Bumper to Bumper Tech Expo held the following Friday and Saturday with more than 3,000 industry professionals in attendance for training, a channel partner booth show and entertainment. “Auto-Wares was proud to host the YANG event and continues to be a firm supporter of the future of our industry and the next generation of workers,” added Leimenstoll.